People and cobots can safely and concurrently work in the same space. This is the fundamental difference between cobots and traditional industrial robots. The picture at left shows a person guiding a cobot, while the cobot's motors are under power! Guiding is not an option with traditional industrial robots. It is is only possible because people and cobots can safely share the same workspace. This greatly increases the world of tasks it makes sense to automate and eliminates the requirement for safety fencing. Because fencing is not required, cobots save floor space and facilitate incremental integration into existing manufacturing operations. Cobots find application in pick and place, injection molding, quality inspection, assembly, machine tending, gluing and dispensing, etc. 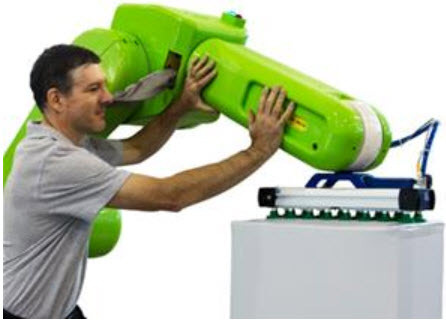 Traditional industrial robots also perform tasks like these, it's just that cobots can do more of them. For example, a cobot and a person can work together to perform an assembly tasks that would otherwise require two people and couldn't be done by traditional robots at all. By eliminating the requirement for safety fencing, cobots can save floor space vs. traditional industrial robots. Cobots, however, are about more than fences. Cobots embody a spirit of removing all barriers to automation. Univeral Robots has done a fine job in this regard with online training and an eco-system of compatible components. Cobots also foster incremental adoption of cobot technology. It doesn't take a big-budget project to put a cobot on a factory floor. An investment on the order of $100k ($50k in purchasing and $50k in labor) can do that. Finally, cobots allow you to bring expertise in-house and skip the integrators. There are lots of issues with using integrators for robot projects, but integrators bring experience to the table. Fencing also has drawbacks, but it makes for an effective and straight-forward approach to safety. The safety issues around cobots can be complex.